Realme CEO Madhav Seth took to Twitter to share camera samples of Realme 3 Pro. The launch of the device is expected in the third week of April. Realme CEO Madhav Seth took to Twitter to share camera samples of Realme’s upcoming smartphone, Realme 3 Pro. While sharing the pictures with the Delhi University students, Seth informed that the launch event of Realme 3 Pro will take place in the campus. Seth uploaded three pictures on Twitter, all supposedly taken from the rear camera of the device with “Shot on realme 3 Pro” watermark at the bottom left corner. 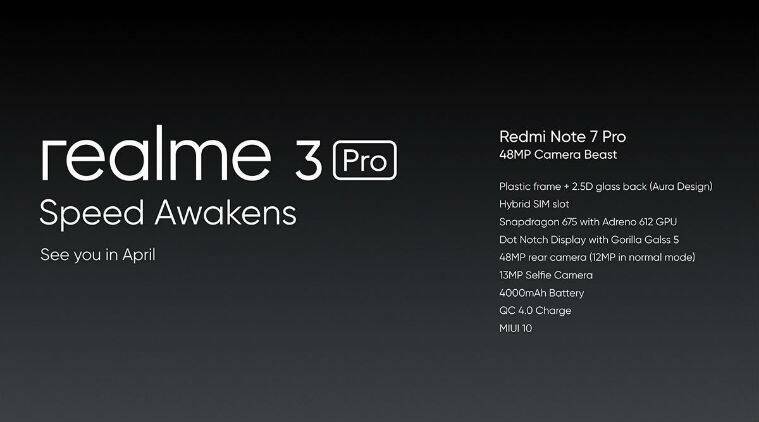 Back in March, at the launch event of Realme 3, Seth announced that the Realme 3 Pro will be launched in April and compete with the Redmi Note 7 Pro. While Realme did not reveal any details about the device, a report claims to have leaked its specifications. According to the leak, the Realme 3 Pro will be powered by 10nm octa-core Qualcomm Snapdragon 710 processor and feature Sony IMX519 camera sensor, which is being used in the OnePlus 6T. It also mentions that the device will be launched in the third week of April. The leak also suggests the VOOC 3.0 fast charging support in the Realme 3 Pro, which can fully charge the device beyond 75 per cent in 25 minutes. Further, it claimed that the phone will be launched in three colours and in three storage models– 4GB RAM + 32GB storage, 4GB RAM + 64GB storage, 6GB RAM + 64GB storage.